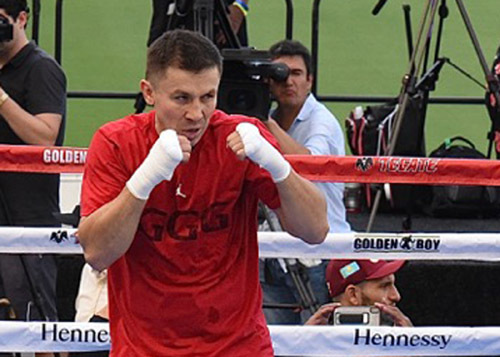 With their much ballyhooed rematch less than one month away Middleweight Champion Gennady “GGG” Golovkin and challenger Saul “Canelo” Alvarez put some 4,000 rabid fans in the seats at The Banc of California Stadium as the two gave us a sneak preview of the coming attraction in Las Vegas on September 15th. Just looking at the reaction of the fans at the event it’s pretty clear that anticipation is high to see these two settle the score from the draw that left everyone wanting more after their first battle in Las Vegas last year. 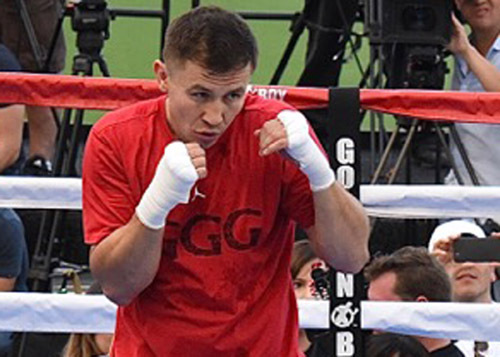 It should be duly noted that Golovkin took the majority of the cheers from the boxing fans in attendance while his nemesis Canelo collected an overwhelming amount of jeers. 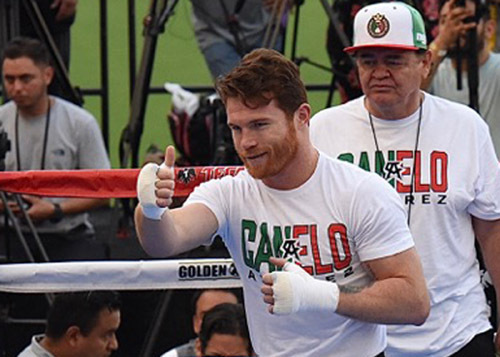 It was also pretty clear Canelo was a lot trimmer than he was during the open work out for fight # 1 last year. It is also worthy to note that last year Alvarez could not wait to take his shirt off to show off his chiseled physique but this year he chose to keep the shirt on while working out. You can do with that information as you will. The anticipation is officially building for this one. Both men look focused and in top shape. With just three weeks to go it’s time to hunker down and get in some final fine tuning for the biggest fight of their respective careers. $5,000, $2,500, $2,000, $1,500, $800, $700, and $500 not including applicable service charges and taxes. There will be a limit of eight (8) per person at the $5,000, $2,500, $2,000, $1,500, $800, $700 and $500 price levels. To charge by phone with a major credit card, call 888-9-AXS-TIX (888-929-7849). Tickets are also available for purchase at www.t-mobilearena.com ;or www.axs.com. A Little Mistake? “Weight” A Minute! JoJo, a little mistake would be that you forgot to pack your mouthpiece in your bag on fight night. Not making weight for a world title fight is a huge mistake, make no doubt about that. What makes it an even bigger mistake is that you were given this undeserved title opportunity after getting schooled by Gary Russell in your first attempt at a world title. You didn’t have to fight your way back to title contention but instead were spoon fed this title shot that quite frankly you did not earn or deserve. As to your statement, “…it was just one little crucial mistake”, it was either a crucial mistake or a little mistake, it can’t be both. Those two words should never be used in the same sentence. For instance one would never use the words Champion and Journeyman to describe a fighter, either he has the goods or he doesn’t! Am I clear? I have had to address this same situation in boxing too many times recently. That being fighters who get themselves into the position to fight for a title and then show up overweight at the weigh-in and lose any chance at winning a title on the scale. It’s pathetic and extremely disrespectful to everyone involved including your promoter and more importantly your fans. There are thousands of fighters with half the talent of Diaz who would do whatever it takes to make weight if they were given a chance to fight for championship belt. It’s a smack in the face to those Ham and Eggers as well. If it were up to me, if a fighter showed up to the weigh-in for a world title fight overweight he would have one chance to re-weigh and if he didn’t make it he would be heavily fined, with most of the money going to the other fighter, and he would not be allowed to fight the next night for any reason. Allowing these guys to fight and then pretend like everything is just fine afterwards is 100% horse dung and should not be tolerated on any level. Solution or Problem For Ryan Garcia? On Friday night after covering the show at The Belasco Theatre in Los Angles it was brought to my attention the Ryan Garcia’s next fight would take place September 1st at Fantasy Springs Casino against Carlos “The Solution” Morales. Posted in Boxing | Comments Off on A Little Mistake? “Weight” A Minute! Don’t look now but Montreal, Canada has become the hotbed for Light Heavyweight World Champions. Three of the four major 175 pound titles in boxing reside in Quebec’s Metropolis. Even more remarkable is the fact that one trainer has tutored two of those champs to the very top. That trainer would be Marc Ramsay. That’s quite an accomplishment for Ramsay who has been working with fighters since 1995. Of the two possibilities I think it’s a lot more likely to see the rematch with Kovalev long before we see Adonis step up to the plate to take on Alvarez. The so-called “Superman” has been ducking him for years; there is no reason to believe he will be changing that tune anytime soon. In the meantime Ramsay will be taking his charges on a wild ride through a Light Heavyweight division stocked full of world class talent. 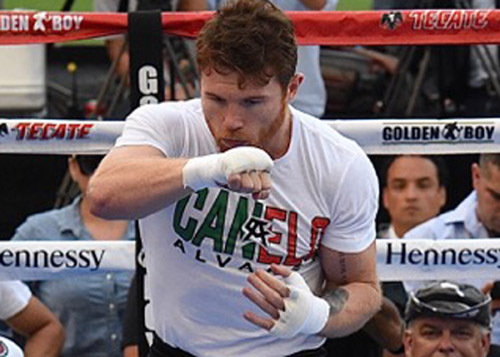 Look for him and his fighters to produce some memorable battles in the coming year. Not since Hurricane Sandy hit the Jersey shores has such a devastating Storm hit the famed Atlantic City Boardwalk. 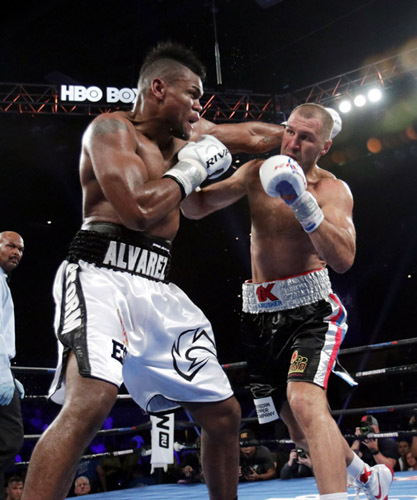 With one Krushing right hand in round seven Eleider Alvarez took Kovalev out into the deep water and left him there to try to swim out of danger. With no life preserver in sight Kovalev struggled to stay afloat but he was no match for the weight of Alvarez’s barrage of punches. Less than a minute later Kovalev sank to the canvas as a jubilant Alvarez celebrated his championship winning performance. Honestly I was surprised to find out that at the time of the stoppage Kovalev was comfortably ahead on all scorecards. In my mind the fight was close and after a slow start Kovalev may have started taking command. But let’s go ahead and take the scores for what they were and give the Champ his just due, fair enough. I can do that. But if you didn’t see Alvarez snapping Kovalevs head back early in the fight with crisp jabs, and if you didn’t see a more than concerned look on Kovalev’s face right away then either you weren’t paying attention or your loyalties to Sergey have skewed your vision. The ebb and flow of this battle made this a very intriguing fight to witness. In the third and fourth rounds Kovalev began to show the form that made him the dominant force at 175 pounds for so many years. 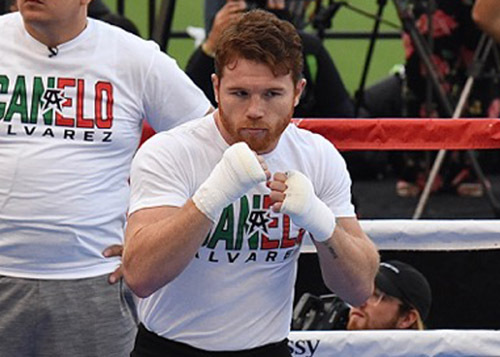 He started laying the leather to Alvarez and was rocking the challenger with his own thunderous barrage. But Alvarez weathered that storm; he did not crumble as so many of Kovalev’s past foes had done. Outside of the fight ending right hand that may have been the biggest blow Kovalev suffered all night. 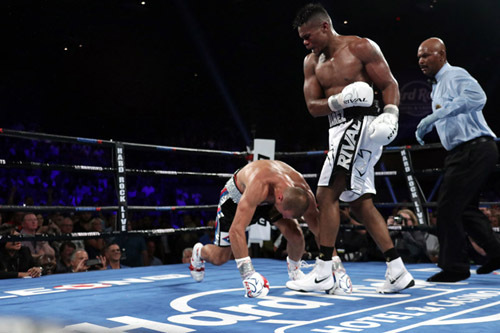 Whether he was gassed from the swarm of punches he threw in the previous rounds, or was unable to comprehend how Alvarez was still there in round seven, Kovalev seemed to have slowed down more than a bit. Seizing the moment Alvarez unleashed a thunderous right hand that staggered Kovalev and then put him on the seat of his pants. That one punch was the fight ender. Kovalev rose to his feet but for all intents and purposes the title had already changed hands. It’s probably not the result they were expecting but after a 4 year hiatus from boxing on The Boardwalk it turned out to be a pretty memorable night in Atlantic City. It’s likely we will be seeing a lot more fights coming back to The Boardwalk. With a rematch clause in place it could be Alvarez and Kovalev would return to Atlantic City, but I wouldn’t be holding my breath. 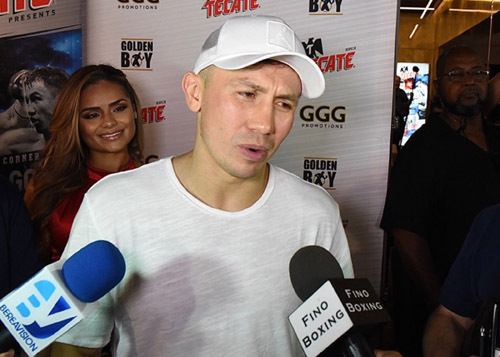 Sergey will be taking a mandatory 90 day vacation due to the KO loss and now that Alvarez threw a monkey wrench into a possible Bivol vs. Kovalev battle it’s anyone’s guess what is next. But with a 175 pound division chock full of young stars it’s bound to be a wild ride at 175 pounds over the coming year or two.